Krishna, Mar 19: Andhra Pradesh Chief Minister N Chandrababu Naidu has claimed that Prime Minister Narendra Modi and Telangana Chief Minister KCR are conspiring against the Telugu Desam Party, while adding that YSR Congress Party chief Jagan Mohan Reddy compromised with Modi to get clear of all cases filed against him. The TDP Chief further mentioned that if Prime Minister Modi comes back to power, minorities would not be safe in the country, while accusing the current NDA government of betraying Andhra Pradesh. At the meeting, Naidu equated his party cadre to Alexander's army and said, “The powerful leader Alexander had an army of 10 lakh soldiers to conquer the world. The TDP has an army of 65 lakh dedicated soldiers who can make every impossible thing possible. TDP will win the upcoming Assembly elections. We have to win 150 plus seats in Assembly and all 25 Parliamentary constituencies." 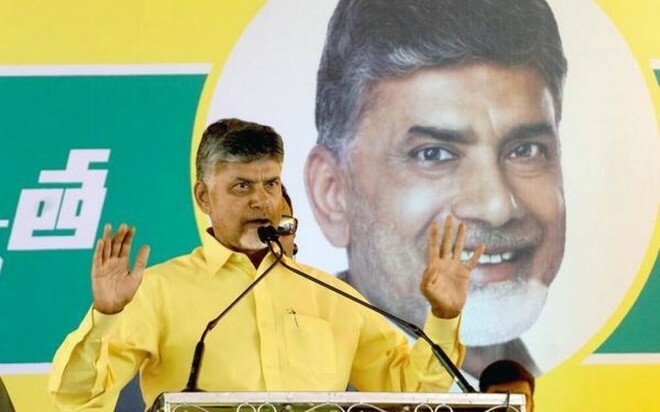 At another party meeting that was held in Ongole, Naidu claimed that Janata Dal (United) National Vice President Prashant Kishore had removed names of over seven lakh voters in Andhra Pradesh. Naidu also said that the Federal Front proposed by KCR will only comprise of TRS and YSRCP. "In fact, it (Federal Front) is formed at the percept of Prime Minister Modi. KCR is cheating people by saying he will be kingmaker in Delhi with 17 MP seats," he added. The 17th Lok Sabha polls and the Assembly polls in Andhra Pradesh will take place on April 11 in a single phase. The results of the Assembly and Lok Sabha polls will be announced on May 23.